Branford's William Linder and Guilford's EJ Vickerman fight for the puck during a boys hockey game on Wednesday, Feb. 6, 2019 at Patsy DiLungo Rink in East Haven. Branford won 5-0. 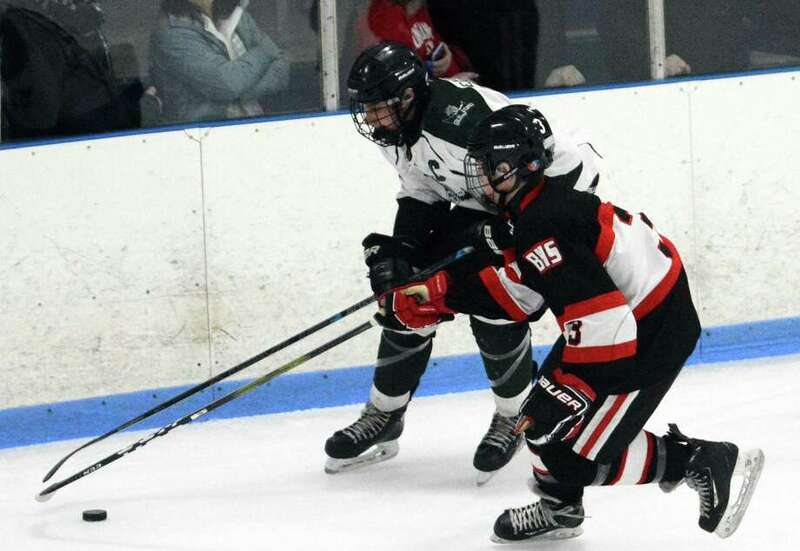 The Hornets, fourth in the latest CIAC Division II rankings, dominated from the opening faceoff and blanked Guilford, 5-0, at the Patsy DiLungo Rink. Branford improved to 4-1 in the SCC/SWC standings and is tied for second in the league, just a point behind Watertown/Pomperaug, which is 4-1-1 in the league. Guilford (11-4) had come into the game with a sizeable lead atop the Division II rankings, but suffered its second consecutive loss. The Indians lost to New Fairfield/Immaculate, 5-3, last Saturday after having won nine straight contests. Branford took a quick 1-0 lead just 26 seconds into the game when Chris Donadio blasted a wrist shot past Attruia. The Hornets made it 2-0 late in the period when Robert Lionetti pounced on a rebound in front of the net and wristed the puck past Attruia with 3:49 remaining. Guilford did have several good opportunities to put the puck in the net but Yakimoff was solid. John DeLucia gave Yakimoff a tough one to save early in the period and Connor Hagness just missed midway through the period when he clanked a shot off the left post. In fact, Branford continued its scoring in the second period, tallying twice to take a 4-0 edge. Just over three minutes into the stanza, Jack Manware’s shot off the right pad of Attruia went right to Max Bunton in the left circle. Bunton pounced on the opportunity, skated toward the net and popped the puck into the top of the net to make it 3-0. Six minutes later, Manware the recipient of a lucky bounce when his shot toward the net hit Attruia in the right leg and went into the net. With Guilford trying to put more pressure on Yakimoff, Branford closed out the scoring with 4:12 to go in the game as Zach Jones fed Manware right in front of the net and he ripped a shot past Attruia. The Hornets defense did an excellent job in shutting down DeLucia and Hagness, not allowing them to get to the net. That allowed Yakimoff to have a relatively easy afternoon in between the pipes as he recorded his fourth shutout of the year. It was only the second time all season Guilford had scored less than three goals in a game and it was the first time the Indians had been kept off the scoreboard. Branford outshot Guilford, 30-23. Yakimoff had 23 saves, while Attruia stopped 18 shots. First Period: — Chris Donadio 0:26; — Robert Lionetti (from Jack Manware 11:11; Second Period: — Max Bunton (from Jack Manware 3:07; — Jack Manware 9:27; Third Period: — Jack Manware (from Zach Jones 10:48. Saves: — Jared Yakimoff 23 on 23 shots; — Alex Attruia 30 on 35 shots.